Predict how variation within a population affects the survival of a species. Recognize that natural selection acts on an organism�s phenotype rather than its genotype. Describe how reproductive and geographic isolation affect speciation. Analyze population changes in terms of the Hardy-Weinberg principle. Understanding a Gene Pool - You will make a model gene pool based on an initial assumed population, collect data to test the Hardy-Weinberg principle, compare your data to predictions in a cross-multiplication table, and use a model gene pool to examine the change in allele frequencies caused by harmful genotypes in a given environment. 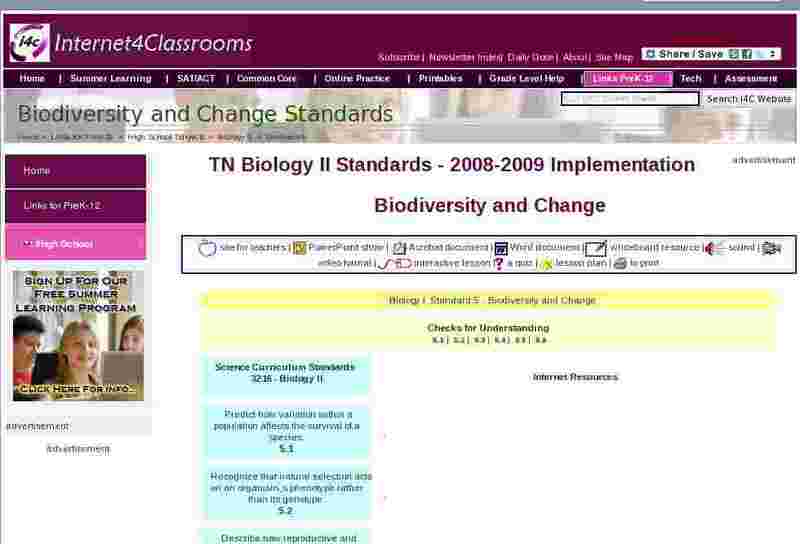 Explain how amount of biodiversity is affected by habitat alteration. Use fossil evidence, DNA structure, amino acid sequences, and other data sources to construct a cladogram that illustrates evolutionary relationships.